I saw so many amazing things at the show but I just thought I would round up some of the new fitness trends I took part in and saw so that you can keep an eye out. 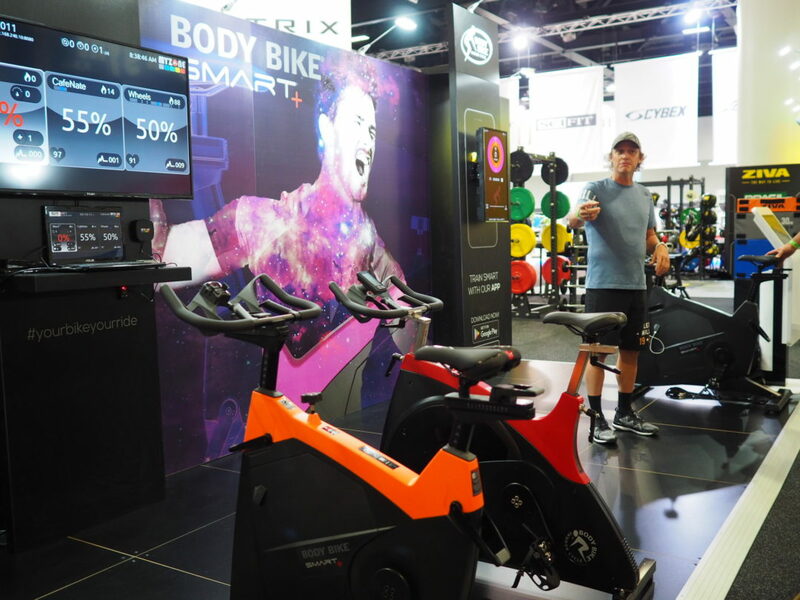 Cycling and charging your phone: new smart Spin bikes from Body bike allow you to charge your phone while you work up a sweat – that harder you pedal the more your phone charges!! How cool is that? Aquastrength weights: now this is something I really want to try! Aqua strength offer underwater ankle weights and barbells allow you to perform a multitude of exercises that focus on dynamic flexibility, upper body, core strength, co-ordination, balance, rotary stability, power, agility and endurance. Simply Breakfast: is a new meal delivery service in Sydney servicing my favourite meal of the day BREAKFAST 🙂 Simply breakfast is combining a talented healthy chef, technology to keep meals fresh and a delivery network to serve up healthy breakfast to Sydney-siders in thrown kitchen each morning. I managed to get me hands on their vegan protein balls and their vegan muesli – i have been using the muesli in my smoothies -so good. Boxing Gyms: The newest chain of fitness studios to hit the market are kick – boxing themed. 9rounds fitness program incorporates a functional, interval, cardiovascular and circuit training regimen. Freddy Aus NZ: I LOVE Freddy wear – they have the nicest selection of jeans and pants with an extra bit of enhancing for the booty – win win! I managed to get my hands on a pair of their black high waisted pants and I really love them – I am always featuring them on my Instagram stories so make sure you take a look. Booty shake: Twerking?? Umm……yeah turns out i’m NOT a natural – haha! But it’s something I would like to perfect….we took part in an awesome twerking class – to be honest I spent most of the class completely mesmerised by the way the instructor moved her body…but I managed to get a good amount of booty shaking going on! 776BC MOTION Apparel: 776BC is an awesome performance clothing brand founded by ex olympian Cameron McKenzie-McHarg and Kate McKenzie-McHarg. Each piece incorporates key biomechanical markers and lines allowing anyone to perfect their movement during most sports or exercises. Prana On VEGAN protein powder: the MOST delicious Vegan protein powder I have found (forget the bland and gritty taste). I have only recently come across Prana and really love their product, I find the flavour is also not too overpowereing which is a plus when making fruity or green smoothies. It is made with added amino acids to optimally fuel the process of muscle growth (hypertrophy), and digestive enzymes to increase the overall bio-availability and assimilation love it! Jabra Headphones: I am a music FREAK, so finding a good set of headphones, especially ones that are fitness friendly is such a priority. I was gifted a pair of the new Jabra ‘Sport Coach’ headphones……with superior sound quality, passive noise cancellation and enhanced bass, these headphones will make sure that your favourite playlist sounds better than ever and will maximise your musical motivation. The built-in TrackFit motion sensor will automatically count your reps and track your every move. Set up your workout in our Jabra Sport Life App and let the in-ear “coach” count your reps, guide you through the circuit and track your performance! Combine cross training with running and the integrated motion sensor will also measure distance, pace, steps, cadence and calories burned – like, this is seriously awesome!! I had such a great time at the show and loved hearing all about the latest trends in fitness as well as seeing some of the awesome shows and events held on the day!